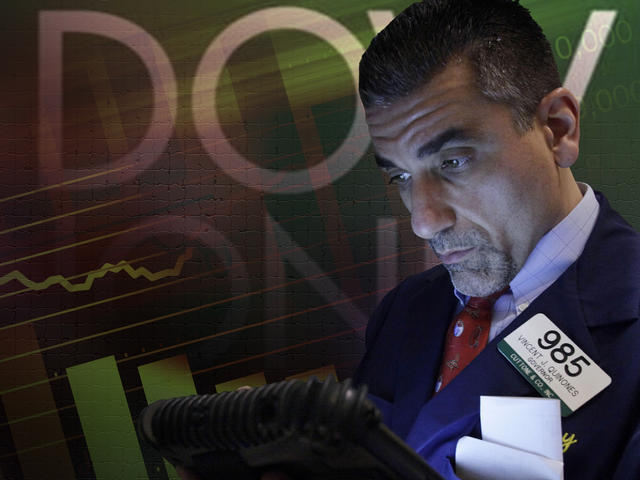 (CBS/AP) NEW YORK - Investors on Wednesday all but forgot the previous day's burdens and sent stocks soaring. It was a stark turnaround from the day before, when they'd pushed the market into a free-fall on worries about European debt and corporate earnings in the U.S.
Those fears about problems festering on both sides of the Atlantic were calmed thanks to a surprising profit from Alcoa (AA) and news that borrowing costs in Spain had edged down, a potential sign that investors have more faith -- for now, anyway -- in that country's financial health. The result was a U-turn on Wall Street. The Dow Jones industrial average climbed as much as 129 points in early trading before settling at 12,805.39, up 89.46 points. The previous day, it had lost 214 points, the cap to its biggest and longest losing streak this year. European markets rose, too. Stocks climbed roughly 1 percent in major capitals, excluding Greece, after losing 2 to 3 percent the day before. Treasury prices fell, signaling that investors are more willing to put money in stocks. Other U.S. indexes also erased much of the previous day's losses. The Standard & Poor's 500 rose 10.12 points to 1,368.71 after losing 24 points the day before. The Nasdaq composite climbed 25.24 points to 3,016.46 following a 56-point loss Tuesday. Alcoa rose more than 6 percent after reporting late Tuesday that it turned a profit in the first three months of the year and handily beat the expectations of Wall Street analysts, who were predicting a loss. Since Alcoa is the first company in the Dow average to report earnings, its results have a greater ability to move the market compared with companies that report later. More first-quarter results will be released over the next few weeks. Market watchers were divided over how long the gains would last and whether Alcoa's profits actually mean anything for the rest of the earnings season. "I'm not predicting we're going to have a blowout earnings quarter," said David Armstrong, managing director of Monument Wealth Management in Alexandria, Va. "But I think if people thought earnings season was going to be bad, they may be pleasantly surprised." "One earnings report?" countered Uri Landesman, president of the New York hedge fund Platinum Partners. The boost "will last until the first bad number." For Europe as well, investors seemed anxious to latch onto any piece of good news. They were cheered that the rate on Spain's 10-year bonds dropped slightly after nearing 6 percent on Tuesday. Seven percent is generally considered the rate at which it becomes too expensive for a country to borrow money. Investors chose, largely, to ignore other signs blaring that problems in Europe are only hibernating and not solved. Spain's borrowing costs are still dangerously high. Italy sold 12-month bonds but was forced to pay more than double the interest rate it paid last month. Even Germany, whose bonds are considered a safer investment, failed to sell all the 10-year bonds it had intended to. In Greece and France, upcoming elections threaten to unravel the uneasy peace that has been reached between the weak and strong countries in Europe. New leaders could unwind hard-fought deals that require Greece and others to cut spending in order to get bailout loans. Greece's unpredictability rose to a new level Wednesday when the country announced it would hold parliamentary elections months ahead of schedule. Landesman described the dealmaking as "Band-Aid after Band-Aid," rather than a real solution addressing Europe's deep-rooted problems of overspending. "You can't do that forever," Landesman said. "There is a day of reckoning." If it is hard to predict news out of Europe, it's equally difficult to guess how investors will react to it - panicking one day and shrugging off similar developments on another day. There are plenty of days the market swings on news out of Europe that is merely incremental, or even when there's no news at all. "A possible European recession? I don't really think that's new," said Armstrong. "For people reacting as if this is new news, I think that's poor discipline as a (long-term) investor." Europe's debt crisis and concerns about U.S. earnings haven't been the only problems for the market in recent weeks. There are also signs that job growth is slowing and that the Federal Reserve is disinclined to pump more money into the economy. Wednesday's gains still don't make up for the market's second-quarter losses. Wednesday was just the second gain for the Dow in the seven trading days so far this quarter. The Dow was up 8 percent at the end of the first quarter, but it's down 3 percent so far for the second. From a longer-term viewpoint, however, the market's recent swings have been relatively mild. The Dow plunged nearly 550 points in the five days ending Tuesday, a molehill compared to the mountain of last summer's frightening drops. Those included an 858-point, eight-day plunge in July and August, as Congress bickered over government debt limits and the S&P prepared to downgrade the U.S. debt rating. In fact, the market's steady rise from Thanksgiving to the end of March has kept the losses of the last few days from being any worse, said Frank Fantozzi, CEO of Planned Financial Services in Cleveland. "It's like a person," Fantozzi said. "If you're feeling good overall and a couple negative things happen, you just shrug it off. If you're feeling lousy and you get some good news, you still feel lousy."